On the 10th I dined with Sir E Lyons 3 on board the Agamemnon, 4 full fig – 12 in all I was very pleased at his asking me not for the Vanity of the thing but others seeing he is my Friend pull more cordially with me – My duty is hard & constant but I get on pretty smoothly. Today Mr. Filder & Adams are both away & I am left to do the duties – You wd. be rather amused at the personal appearance of Officers here Guardsmen & others Coats torn & soiled epaulet & feathers broken, boots out unshaven hair long few looking Clean. Dr. Munro 5 just gone out of my place having come to beg of me for auld lang syne to give or get him a cake of soap for himself a bar or part or one for his Servant & a tallow Candle or two, he is now Surgeon to 93rd Highlds – For myself, if you should ever be taking a morning Stroll on the Wharf at Balaklava & meet a tolerably stout person in Silver Specs, with long red beard very thick & fierce moustache, in fact hair only cut away, just to leave room for soup, blue old Coat (no Straps on Shoulder) 6 & Wt coat & Blk pants, blue forage Cap walking & talking very fast, that is your hub: I found in getting into my dress Coat the other day that I was rather thinner than when I wore it last which is rather an improvement. 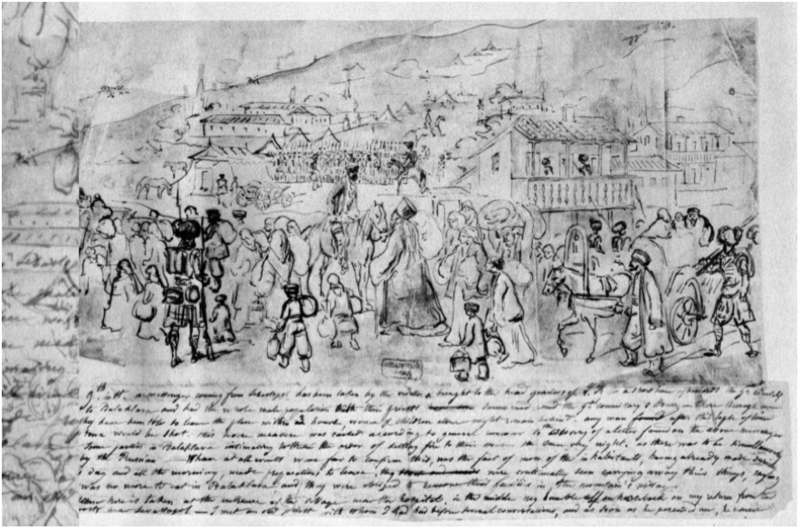 from Karen W. Smith, Constantin Guys: Crimean War drawings 1854-1856, (Cleveland, Ohio, 1978), p. 17.